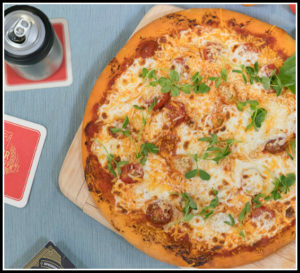 Image of Margarita Pizza with Lager Crust taken for the Beer Institute. Recipe was created by Chef Laurent Aubel. Preheat the oven to 450° F. (Don’t skip this step, it’s important the oven is hot before you start cooking the pizza). In a medium bowl, dissolve yeast and in warm water. Let stand until dissolved about 10 minutes (will resemble a creamy texture). Stir in flour, salt, olive oil and lager until smooth. Let rest for 5 minutes. Turn dough out onto a lightly floured surface and roll into a round. Transfer crust to a lightly greased pizza pan. Add pizza sauce onto the center of the pizza and use the back of the spoon to spread sauce almost to the edge (leave about a ¼ inch). Sprinkle cheese and tomatoes on top and bake in preheated oven for 15 to 20 minutes. Remove and let the pizza cool for 5 minutes before serving.